In cold climates, a common practice of the weatherization industry is to retrofit compact roof/ceiling assemblies with blown-in dense-pack cellulose. However, this assembly has high moisture and durability risks (due to wintertime interior-sourced condensation) and violates building code. Developing methods to retrofit dense pack insulation into compact roof assemblies while controlling moisture risks would allow for widespread application of this lowcost technique without potentially compromising building durability. To understand the long-term moisture performance of unvented roof assemblies with fibrous insulation, test roofs were built in two climates and monitored. A cold-climate test house was located in Bolingbrook, IL (Chicago area; Zone 5A), and hot-humid test house was located in Friendswood, TX (Houston area, Zone 2A). One test house was monitored at each site. underneath the vapor-impermeable shingles. The four "top vent" roofs were two fiberglass batt and two dense-pack cellulose roofs, with either interior gypsum board, or open to the interior. Wintertime moisture-related failure was accelerated by providing interior humidification (72°F/50% RH; known to be an extreme interior loading). Data captured eight months, including a winter and following spring/early summer. Under these conditions, all roofs except the vented cathedral assembly experienced wood moisture contents (MCs) and RH levels high enough to constitute failure. The unvented densepack cellulose roof experienced sheathing moisture MCs well above 40% at the ridge (i.e., risk of mold, rot, and decay). MCs lower in the roof were less severe (above 30%), but still in the dangerous range. In all assemblies, sheathing MCs were corroborated by rafter MC and roof peak RH. Other sensors indicated that liquid water condensation was occurring at the peak of all unvented test roofs. The diffusion vent roof had similar behavior to the unvented cellulose roof, but in the spring, ridge conditions dried much more rapidly in the diffusion vent roof. The "top vent" assemblies showed similar behavior to the unvented assemblies (high MCs). Roof assemblies with gypsum board has drier moisture levels than the assembly without gypsum board, which is consistent with the painted gypsum board providing some level of air leakage and vapor flow control. When the results were analyzed using ASHRAE Standard 160, all of the unvented roof assemblies failed for significant portions of the spring, showing that moisture levels remained high into warmer weather, which would have allowed mold growth. The roof was disassembled at the end of the experiment, to correlate measurements with actual assembly conditions. The unvented fiberglass batt roofs had wet sheathing and mold growth, although not structural failure. The cellulose roofs had only slight issues, such as rusted fasteners, staining and sheathing grain raise, despite the measured extreme moisture conditions. This difference was ascribed to cellulose’s borate preservatives, its airflow retarding properties (especially compared to batts), and its ability to safely store moisture. The comparison of batt (installed with gaps) vs. loose fill insulation puts the fiberglass roof at a disadvantage. The Houston-area roof is in a model house, which is unoccupied during the testing period. The test house was configured with an unvented/sealed attic, insulated at the roofline. Unlike the cold-climate roof, the entire roof was insulated with a single material (spray-applied/adhered fiberglass, left exposed). No intentional humidification or conditioning was provided in the unvented attic space; the space “floats” at conditions between interior setpoint and exterior conditions. Most of the roof ridges and hips were built with a “diffusion vent” detail, capped with a strip of a highly vapor permeable (550 perms) roof membrane. Some ridge sections were built as a conventional unvented roof, as a control comparison. Data have been collected from February 2014 through June 2015 (16 months), with ongoing data collection. In the control unvented roofs, roof peak RHs reached high levels (90%+) in the first winter; as exterior conditions warmed, RHs quickly fell to 40-50%, as solar heating drove moisture out of the roof sheathing (inward). MC measurements were consistent with RH measurements: initial winter conditions were higher than recommended, but fell to safe levels in the summer. In the second winter (2014-2015), peak RHs rose again (60-80% typical), but not to the same levels as the first winter. This difference was due to lower interior RH levels in the second winter. roofs. This was attributed to the limited diffusion vent area (2 in. diameter drilled holes, rather than 3 in. strip) available in the hip geometry. In cold climates, a common practice of the weatherization industry is to retrofit compact roof/ceiling assemblies (e.g. cathedral ceilings) with blown-in dense-pack cellulose. Cold climate house plans often have conditioned space with compact sloped roof/ceiling assemblies above. This dense-pack retrofit minimizes the interior and exterior demolition required for retrofitting insulation, compared to (for example) spray foam retrofits. However, a dense-packed compact roof assembly has high moisture and durability risks (due to wintertime interior-sourced condensation), as discussed by Lstiburek (2010b), and Schumacher and LePage (2012) (Figure 1). In addition, this assembly does not meet building code: §R806.4 “Unvented attic assemblies,” of the International Residential Code/IRC (ICC 2009) has requirements for minimum quantities of air impermeable insulation on the exterior side of the assembly, to control condensing surface temperatures in winter. Developing methods to retrofit dense pack insulation into compact roof assemblies while controlling moisture risks would allow for widespread application of this lower-cost technique without potentially compromising building durability. In hot-humid climates, HVAC equipment (both ductwork and air handlers) are typically located in vented, unconditioned attics, with associated energy penalties due to duct leakage and conductive losses. One method of moving the ductwork inside the conditioned space (air barrier and thermal barrier) is to insulate at the roof deck, creating a “cathedralized” attic space (Rudd et al. 1997, Rudd and Lstiburek 1998, Lstiburek 2006). However, market penetration of this method has been slow despite its performance benefits, due to the expense of insulating at the roof line, typically using polyurethane spray foam (a more costly material than typical fibrous insulation materials). 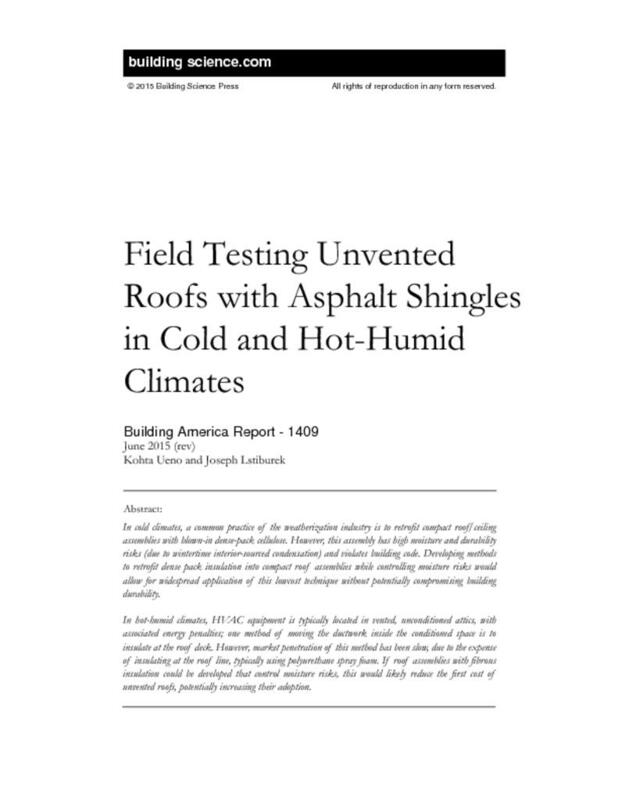 Previous experience of creating “cathedralized” attics in a hot-humid climate (DOE Climate Zone 2A) with asphalt roof shingles showed that moisture-related failures (condensation at the ridge) can occur (see §“Field Experience in Houston, TX and Jacksonville, FL”); this led to the requirements provided in §R806.4 of the IRC (ICC 2009). If roof assemblies could be developed that control moisture risks, this would likely reduce the first cost of unvented roofs, potentially increasing their adoption. Both of these issues are, at their core, studies of the moisture-safe performance of unvented roof assemblies, with moisture vapor impermeable roofing materials (i.e., layers of asphalt shingles and underlayment) on the exterior. This research involved building and instrumenting a variety of unvented roof assemblies insulated with air permeable insulation (such as dense-pack cellulose) in cold and hot-humid climates, and to analyze their moisture performance over time. The goal was reasonable-cost, low moisture risk, and buildable assemblies that could be promoted in both the new construction and retrofit markets. The experimental approach was to build unvented roof test assemblies in houses, and to install instrumentation to measure their long-term moisture performance (i.e., long-term monitoring). The cold-climate test house was located in Bolingbrook, IL (Chicago area; Zone 5A), provided by K. Hovnanian Homes. The hot-humid test house was located in Friendswood, TX (Houston area, Zone 2A), provided by David Weekley Homes. One test house was monitored at each site. returning it to its original, non-experimental condition. The Houston-area roof is in a model house, which is unoccupied during the testing period. The test house was configured with an unvented/sealed attic, insulated at the roofline. Unlike the cold-climate roof, the entire roof was insulated with a single material (spray-applied/adhered fiberglass, left exposed/no interior finish). No intentional humidification or conditioning was provided in the unvented attic space; the space “floats” at conditions between interior setpoint and exterior conditions. Most of the roof ridges and hips were built with a “diffusion vent” detail, capped with a strip of a highly vapor permeable roof membrane. Some ridge sections were built as a conventional unvented roof, as a control comparison. Data have been collected from February 2014 through June 2015 (16 months), with ongoing data collection. Instrumentation was installed as per Straube et al. (2002), using a central data acquisition system per house. The roof assemblies were measured for temperatures, wood moisture contents (both sheathing and framing), and relative humidity. Interior and exterior temperature and relative humidity conditions were measured on-site; exterior data was supplemented by airport weather data (e.g., precipitation and wind). Instrumentation listing and specifications can be found in Appendix A. In cold climates, retrofit insulation of roofs with dense-pack cellulose is a lower-cost and less intrusive technique than demolition and the use of spray foam insulation. However, it runs the risks of moisture and durability problems. Removing this obstacle will allow its adoption in cases where it would have been avoided in the past. In hot-humid climates, unvented roof assemblies can be used to bring ductwork and air handler units into the conditioned space, and improve airtightness. Doing so with materials that are lower cost than spray foam (the current solution) may increase its adoption. By end of 2015, address common practices that use methods in violation existing codes, including those routinely performed by the weatherization industry such as dense packing unvented cathedral ceilings and low slope roofs. Significance: Promoting methods that violate existing codes raise legal, moral and ethical issues. Challenges: Field testing of alternative methods in various climate zones is necessary. Often failures and lessons learned are not disclosed due to litigation. This work also falls under the category of “2.0 Risk Reduction and Minimization,” from the document FY 2014 Residential Energy System Research Needs (NREL 2013a). One of the goals of this research is to find moisture-safe methods to replace higher-cost spray polyurethane foam (SPF), or rigid board foam with lower cost fibrous fill insulation. The retrofit of an empty cavity (as per the cold-climate example of retrofit insulation of a cathedral ceiling) will clearly be a cost effective measure; this is compounded by the moderate air sealing effects of dense pack insulation (per Schumacher 2011). The installed cost of closed cell spray foam (ccSPF) varies strongly based on contractor availability, the size of the installation, regional pricing, feedstock (crude oil) prices, and access (e.g. requirement for lifts or scaffolding; confined space installation). However, a typical installed price used for estimation purposes is roughly $1/board foot (1 in. x 12 in. x 12 in. ), although pricing variations range in practice anywhere from $0.45 to $1.40/board foot. A comparison of insulation material costs is shown below in Figure 2, based on “big box” home center pricing gathered from 2007 through 2011. It is shown using the normalization metric of $/sf·R value, which normalizes the area costs based on the R values. It shows values for extruded polystyrene (XPS), polyisocyanurate, fiberglass, cellulose, spray foam, and mineral fiber. Note that closed cell spray foam is included in the graph with a caveat: there is no isolated “material cost” for ccSPF, since it is effectively manufactured and installed as a single step. An estimate was made using the $1/board foot price and dividing by 2 (½ materials and ½ labor). It is evident from the graph that ccSPF is at a comparable price to the rigid board foam plastic products (XPS and polyisocyanurate), which are both substantially more expensive than cavity fill fibrous insulation, such as fiberglass or cellulose. Closed cell SPF, XPS, and polyisocyanurate are all premium products—with an associated cost penalty—because they are air impermeable insulation materials that are intrinsically moisturetolerant. When designing enclosures, these premium materials should be used to take advantage of their properties. Assembly R value can be augmented (if desired) with lower cost fibrous insulation products, assuming that durability is not compromised by adding it to the design. The basic benefits of retrofit insulation of compact roof assemblies (including cathedral ceilings) include energy savings due to reduced heat flow and reduced air flow, and thermal comfort improvements for occupants (due to radiant surface temperature effects). Benefits of unvented roof assemblies in hot humid climates include energy savings due to the elimination of duct conductive and air leakage losses; shifting the enclosure geometry to the roof line commonly improves building airtightness. In addition, bringing the ductwork and HVAC equipment within the conditioned space can reduce the risks of surface condensation on cold equipment surfaces, compared with high-dewpoint attic (essentially exterior) air. The “top ventilated” deck warrants further explanation; Schumacher and LePage (2012) provide a description of the design, with recommendations for implementation; a conceptual illustration is shown in Figure 6. A number of low-rise residential roofing systems incorporate ventilated gaps between the roofing and the roof deck (e.g. clay roof tiles, concrete roof tiles & slate tiles installed on strapping; cedar shakes installed over drainage/ventilation mat). The top-ventilated deck strategy might be considered for dense-pack insulation retrofits where the existing ceiling must be kept but exterior insulation cannot be added (e.g. due to historical preservation considerations, spatial limitations or cost constraints). When a ventilation gap is incorporated above the roof deck, the roofing can dry to the underside. If a vapor permeable underlayment is used, the roof sheathing can also dry to this ventilated gap; however, the rate of drying through the sheathing is limited by the vapor permeance of the sheathing and the drainage plane installed on top of the sheathing. implemented, it should be completed using plywood sheathing and high vapor permeance underlayment. BSC made discoveries on unvented roof behavior in hot humid climates during field implementation; several of these roofs were built in the Houston TX area circa 2001 (IECC climate zone/CZ 2A). The typical roof assembly was asphalt shingles, roofing felt, OSB sheathing, and netted and blown cellulose insulation (see Figure 7 left). Netting was attached to the underside of the dimension lumber (2x8 to 2x12) rafters. However, during the first fall of operation, the homeowner reported seeing reflections of moisture condensation and dripping from the ridge of the unvented attic, from the interior. Site investigations (see Figure 7 right) revealed that at the ridge, there were elevated wood moisture contents, and evidence of previous condensation (such as rusted staples). In addition, the cellulose insulation at the peak had a noticeably “packy” or compactable texture, as opposed to the “fluffy” texture of dry cellulose. This failure was localized at the peak of the roof. These moisture issues were remediated by removing the insulation at the roof ridge; of course, there was a thermal penalty associated with this modification. A similar type of issue occurred in two production homes in Jacksonville, FL (CZ 2A), circa 2000. Again, the roof assembly was asphalt shingles, roofing felt, OSB sheathing, and netted and blown cellulose insulation (Figure 8, left). The house was relatively airtight for the climate (2.5 ACH 50). During a site visit, the cellulose and roof sheathing above were wet to the touch, and the steel truss plate was corroded; however, there was no wood decay. In response, the insulation was removed near the ridge (roughly two feet, per Figure 8, right), to increase surface temperatures at the condensing roof sheathing surface. This roof has been rechecked over time (circa 2003, and as recently as March 2014); roof sheathing conditions remain dry with this assembly. Moisture issues in unvented roof assemblies often manifest in the form of damage to the sheathing at the ridge of a sloped roof, colloquially known as “ridge rot.” An example is shown in Figure 9, which was a dense pack cellulose roof in a northern California location (CZ 3C Marine). These issues occurred soon after construction (first winter); the problems were manifested as paint blistering at the interior gypsum board near the roof (Figure 10, right), due to dripping of accumulated condensation. The issue was definitely localized at the ridge of the roof; disassembly at lower portion of the roof showed dry sheathing conditions (Figure 10, left). Air barrier imperfections at the interior gypsum board (in particular, at the ridge board interruption) were a contributing factor. The pattern of moisture accumulation seen here and in Zone 2A influenced the experimental design: sensors were concentrated near the roof ridge, where problems appear to be prevalent. Salonvaara et al. (2013) studied unvented attics with simulations in CZ 1 through 4. They first presented an overview of unvented (or sealed) attics, with the positives and negatives of this design, compared to conventional vented attics. The authors calibrated their models against field monitoring results from Boudreaux et al. (2013). One factor noted when comparing modeled and monitored results was the difference between the high temperature (140°F/60°C) sorption isotherm (relationship between relative . . .